Mamaskatch: A Cree Coming of Age has been recognized by the Governor General’s Literary Awards as the winner of 2018 Non-Fiction award (English). Author Darrel J. McLeod is Cree from Treaty 8 territory in Northern Alberta. The winners include 14 of the best Canadian books in seven categories in English and French. On Nov. 28, Julie Payette, Governor General of Canada, will present the awards at Rideau Hall in Ottawa. Each winner receives $25,000. The publisher of each winning book receives $3,000 to support promotional activities. The efforts of first time author Darrel J. McLeod are being recognized by one of our country’s most prestigious writing awards. 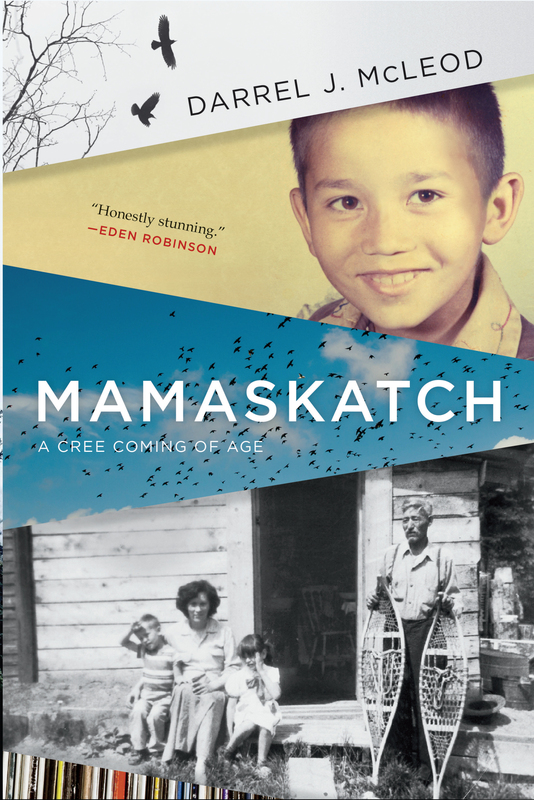 On Oct. 3, the Cree man who grew up near Lesser Slave Lake learned his memoir Mamaskatch: A Cree Coming of Age had been named a Governor General Literary Award finalist in the English non-fiction category. “It was amazing news to wake up to,” said McLeod. Winners for the Governor General’s Literary Award will be announced Oct. 30. McLeod believes it’s important for Indigenous people to tell their own stories, but it’s just as important for non-Indigenous people to listen to those stories. Being shortlisted for a Governor General award will catapult McLeod’s work to the must-read list. Midway through his tour to promote Mamaskatch, McLeod has already had incredible turnouts, the vast majority of which have been non-Indigenous listeners. “People were coming up and getting me to sign the book and very positive about the book and very positive about my presentation,” said McLeod. While he believes there are geographical pockets in Canada that are ready for reconciliation, he is quick to admit that racism and intolerance have become the norm. Bigotry is reflected in more recent provincial and international elections, and McLeod draws attention to prairie organizations like the Frontier Centre for Public Policy, which questions the devastating impacts of residential schools. “I speak very specifically about my mother’s experience and the experience of my aunties in Grouard residential school. Mom talked about it, very specifically, how she suffered,” he said. Mamaskatch is a memoir of themes that are covered through linked story-like chapters, and the chapter on residential schools reveals how his mother and aunts were humiliated by the nuns for speaking Cree. They received only bread and water for two days and were made to walk barefoot, with their moccasins dangling from their necks. “My book is the account of my experience and that of my family to colonization, and it’s very personal and very intimate. The impact colonization has had on just a couple of generations on my life and the life of not only my nuclear family but my extended family,” said McLeod, who speaks a little bit of Cree. He is fluent in English, French and Spanish. McLeod’s varied career has included working with youth. He knows their struggle with his own life impacted by the disintegration of family, poverty, suicide, gender identity issues, racism, and bullying. “Things have improved, though,” he said, pointing specifically to education and how more Indigenous children are graduating from high school and going on to post-secondary learning. McLeod is well into his second memoir having just received the editorial feedback. He says he learned a lot from writing his first memoir, which is obvious in that 10 of his 14 chapters are “ready to go.” He also had the confidence to vary his style, including successfully experimenting with “magical realism” in the closing chapter of his second memoir. McLeod signed a two-book deal with Douglas & McIntyre and the second book is due to come in 2019. McLeod has spoken at a number of prestigious events, including the Winnipeg International Writers Festival, the Victoria Festival of Authors, Word Vancouver and Whistler’s Readers and Writers Festival. In Alberta, he’ll be making stops at LitFest in Edmonton (Oct 17), and launching his book in Calgary (Oct. 20). He is also lined up to present at the Ottawa International Writers Festival.